This year we celebrated the Twelfth Annual So Be Free in the beautiful and spectacular setting of Cave Creek Canyon, on the eastern side of southeastern Arizona's second largest Madrean Sky Island mountain range, the Chiricahua Mountains, at the American Museum of Natural History's Southwestern Research Station, Cave Creek Canyon, Chiricahua Mountains, southeastern Arizona. Director, Dr. Dawn Wilson; Station Manager, Diane Smith. The Southwest Research Station (SWRS) lies in the northern portion of what is commonly called the Madrean "Sky Island Country", consisting of numerous mountain ranges rising thousands of feet above the surrounding deserts. To the south are the main mountain masses of the Sierra Madre Occidental in Mexico, while to the north lies the Mogollon Rim of central Arizona. The Chiricahua Mountains are one of the largest of these "sky islands", reaching elevations greater than 9000 feet. They are world-renowned for their bird and butterfly faunas, support extensive conifer and mixed oak-pine forests, oak encinal above the low lying deserts, and include rugged and spectacular cliffs, canyons and permanent streams. The SWRS is situated in Cave Creek Canyon, on the east side of the range. The Mexican border is only about 30 miles to the south, with a rich and still poorly known bryoflora. Within 3 hrs drive of the SWRS are several other mountain ranges formed of sandstone, limestone and volcanic rock, providing a wide range of habitats. The Chihuahuan Desert lies directly east and southeast of the mountains, while the Sonoran Desert lies to the west. The unusual and threatened San Rafael Grasslands lie to the southwest. About 2 hrs to the southwest is the old copper mining town of Bisbee, where the copper moss Scopelophila has been collected. 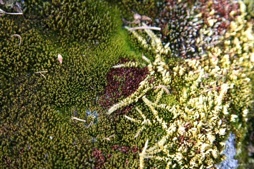 Surprisingly little field work has been done in the region on the bryophytes, and there is good potential for discovering species new to the U.S. While on a recon trip in January this year, I collected an Entodon in Cave Creek Canyon that had previously only been known from a small area in Big Bend National Park in Texas; in one hand grab along Cave Creek, I picked up Entodon beyrichii, Rosulabryum andicola, Pseudoleskeella arizoniae, and a large unusual Schistidium.